Outstanding sound and audio fidelity doesn’t always have to cost you an arm and a leg. 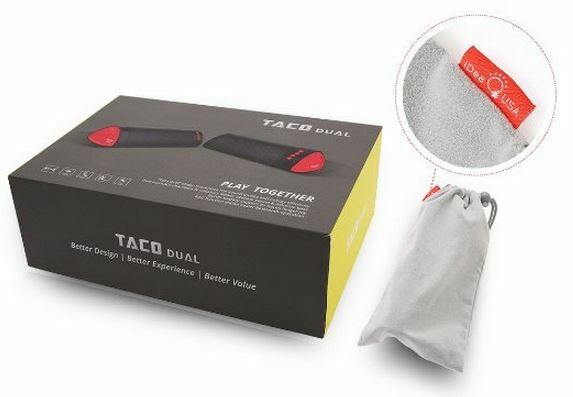 We were fortunate enough to receive a set of the iDeaUSA TACO Dual Boombox Bluetooth Wireless Speakers to prove that point once and for all. Coming in at a price tag at around $60, we were absolutely impressed with the outstanding sound and high quality effects that this set of portable speakers provides. 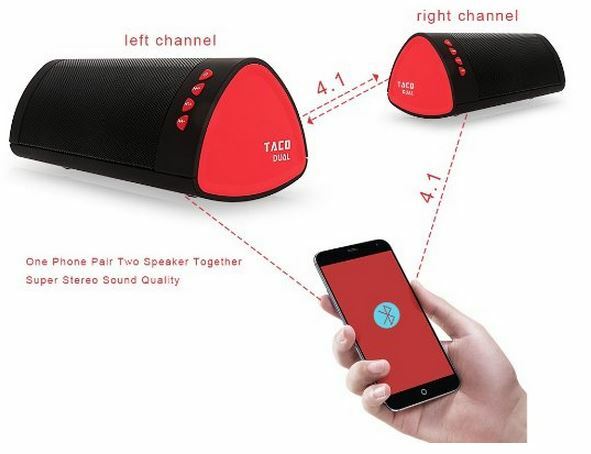 Utilizing the latest Bluetooth 4.1 technology, the iDeaUSA TACO Dual Boombox operates completely wireless, up to 33 feet away from the audio source, without any latency or connection issues. Starting them up is easy. Simply press the power button simultaneously and the left and right channels will be automatically synchronized with your favorite audio source. Using NFC, you won’t have to go through a long and complicated setup – everything is automated so you’ll be enjoying your tunes within seconds of powering them on. Utilizing two super high powerful 45mm drivers for a total of 6 watts in each speaker, you can expect superb audio clarity without any interuptions. These drivers work in part with the shape of the speaker to emit acoustically perfected sound that you’d expect to hear from a boombox that costs three times as much. The dynamic sound is perfect for parties, events, getting ready in the morning, or relaxing in the afternoon in your home or office. With any wireless speaker, some people may stereotype poor volume or weak power. 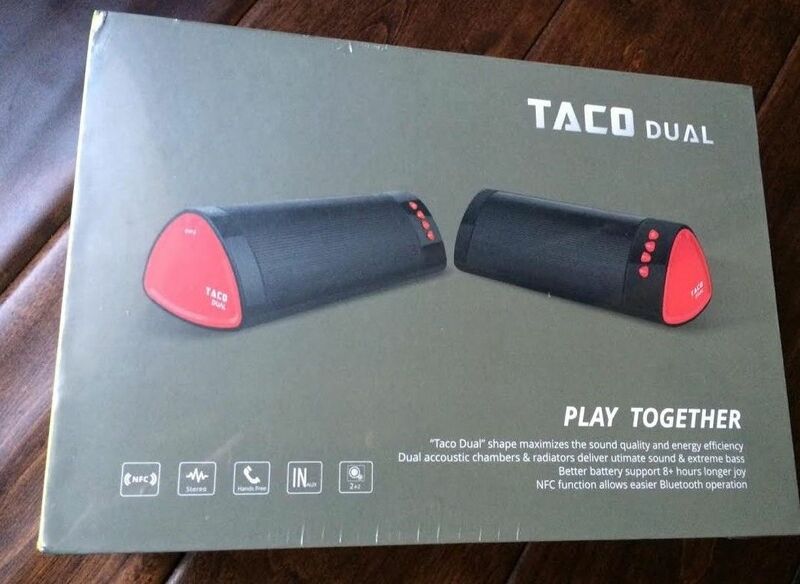 This simply isn’t the case with the iDeaUSA TACO Dual Boombox. Turning up the volume is easily done by pressing one button on either one of the speakers. Surprising to many, the volume range is absolutely amazing. These things are LOUD! Each speaker is equipped with it’s very own 3.7V 1400 mAh rechargeable battery that enables you to listen to music for a continuous 10 hours before you need to plug it in for any additional charging. This is quite impressive considering the volume it delivers with outstanding audio fidelity. To charge it, you’ll need to plug them into an available USB port and wait a few hours before the charging is completed. Although they’re not the smallest wireless speakers available, they are definitely one of the most well designed. Their shape works efficiently to emit sound in a precise pattern that accumulates the volume and bass to a whole new level. Since each speaker is in the shape of a triangle, the sound reflects in a uniformed pattern to boost the effect as best as possible. 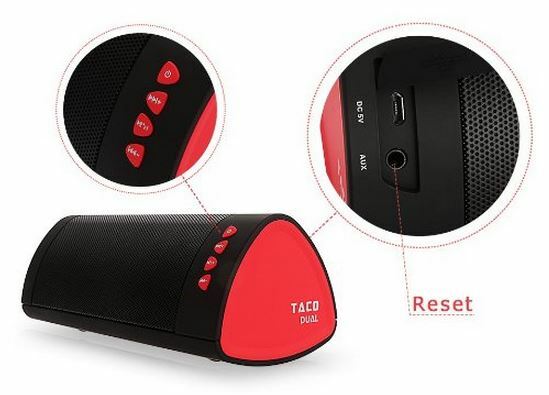 Along with the two speakers themselves, there are a few additional accessories that are designed to make your ownership with the TACO Dual Boombox a bit more pleasant. Each speaker comes with a soft fabric carrying pouch with a drawstring on the top. When you’re not using them, place them securely in these bags and you’ll protect them from any unforeseen mishaps. There’s also two USB cables that are used for charging, two AUX cables for hooking them up to a non-Bluetooth audio source. Sometimes your favorite tunes aren’t on your preferred audio source and you may need to hook them up to a device that isn’t compatible with Bluetooth. Last but not least, an easy to follow user manual is included to help you through the installation and setup process for the first time. Once you figure them out, you probably won’t ever need this user manual again, but it’s a nice gesture that they’ve included it. With any piece of electronic or audio equipment, it’s nice to see that there’s a guarantee against defects and failures. 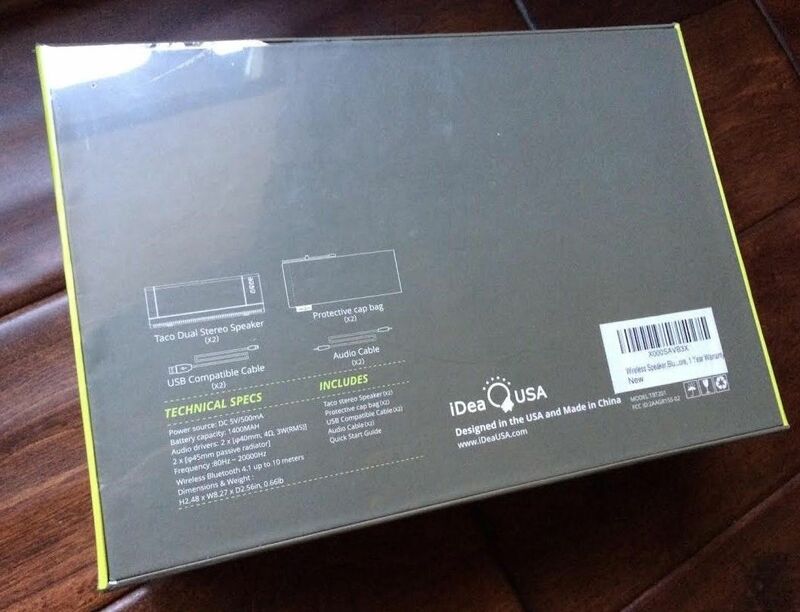 iDeaUSA stands strong behind their product and includes a warranty card for registering them upon ownership. If you have any issues with them, contact iDeaUSA and they’ll take care of your inquiries without hesitation. Investing in a set of wireless speakers is a great idea if you enjoy your music everywhere you go. Since the iDeaUSA TACO Dual Boombox is completely wireless, you can take it just about anywhere you go – inside or outside. 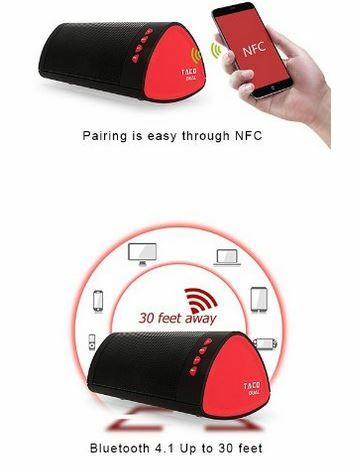 Compatibility is simple since you can use them with any Bluetooth enabled device that exists including your iPhone, iPad Mini, iPad 4/3/2, iTouch, Blackberry, Nexus, Samsung or other Smart Phones and Mp3 Players. Even if you don’t necessarily have the luxury of Bluetooth, you can still use the supplied AUX cables to hook these speakers up to play any music from just about any device you can think of. After a week of using them for ourselves, we honestly couldn’t be happier. The audio quality is outstanding, the reliability is superb, and the overall build quality can easily be compared to Sony, Creative, Harman Kardon, and even Bose. 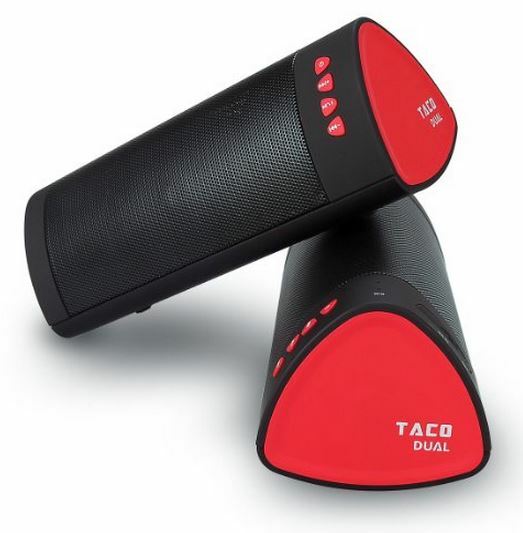 If you’re looking for a great investment in a Bluetooth Wireless Speaker that doesn’t break the bank, definitely consider the iDeaUSA TACO Dual Boombox – you surely won’t be disappointed. I absolutely love my Taco speakers, the only thing I don’t like is that it has a voice incoming call feature. I use the speakers for my massage therapy practice so this is not cool. Yes there is. You can turn off the incoming calls at bluetooth settings.